hence leads to improved human well-being. Poor water quality affects the environment and human well-being. Waterborne diseases cause the death of more than 1.5 million children each year. 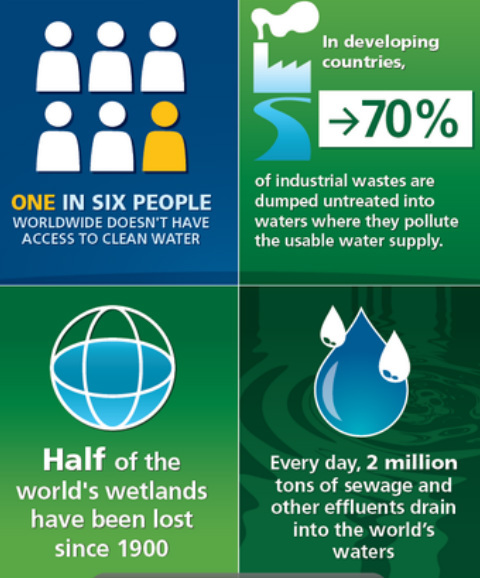 The quality of water resources is increasingly threatened by pollution. Human activity over the past 50 years is responsible for unprecedented pollution of water resources in history. It is estimated that over 2.5 billion people globally live without adequate sanitation. Many of the water pollutants have long-term negative impacts on water quality, constituting a risk to human health. As a result fresh water is severely reduced. Also, the ability of ecosystems to provide services is drastically reduced, at times with irreversible effects. Consequently the environment is degraded through decreased productivity of biomass, loss of biodiversity and vulnerability to other stresses. It is far cheaper to protect water resources than to clean up after pollution. Protection and maintenance of aquatic environments ensures the sustainability of their ecosystem services i.e. benefits such as potable water, fisheries, recreation and tourism. For instance fully-functioning natural wetlands filter off nutrients and toxic substances from water. Increased funding is required to protect ecosystems and prevent water pollution. Funding should support, and be complemented with, concerted well targeted awareness raising initiatives on water quality issues. How extensively is water pollution and environmental degradation in your country? How can lack of freshwater interrupt, or even reverse development in a country? What needs to be done to protect our waters from pollution and degredation?